Mingaladon Township (Burmese: မင်္ဂလာဒုံ မြို့နယ် [mɪ̀ɴɡəlàdóʊɴ mjo̰nɛ̀]) is located in the northernmost part of Yangon, Myanmar. 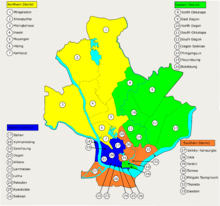 The township comprises 31 wards, and shares borders with Hmawbi Township in the north, North Okkalapa Township in the east, Insein Township and Shwepyitha Township in the west, and Mayangon Township in the south. Mingaladon is still relatively undeveloped and lacks basic municipal services. The Burmese place name Mingaladon (မင်္ဂလာဒုံ) is a portmanteau of two words: Pali mangala ("blessed") and Mon ဍုၚ် ([dɜŋ], "town"). 1 2 3 4 "Mingaladon Township". Yangon City Development Committee. Archived from the original on 2 October 2011. Retrieved 2009-03-21. ↑ Hopple, Paulette (May 2003). "2. Burmese Grammatical Units". The Structure of Nominalization in Burmese (PDF). University of Texas at Arlington. p. 71. ↑ "Getting Around Yangon". Myanmar's Net. Retrieved 2008-10-14.